This new passenger bus meets every science fiction checkbox out there. Self-driving vehicles are the Holy Grail of the transportation technology of the next age. It’s the stuff of science fiction, but it’s coming to life. Big companies like Google, Tesla, General Motors, and even the US Government are accelerating research into the field. But it seems like a small startup beat them to the punch. Arizona-based startup Local Motors has just revealed a 3D-printed, autonomous, electric shuttle bus that is partially recyclable. It’s called Olli. The electric vehicle, which can carry up to 12 people, is equipped with IBM Watson Internet of Things (IoT) for Automotive, which is IBM’s car-focused cognitive learning platform. The company, unlike others that mix traditional automotive making and self-driving tech, builds the vehicles from the ground up, and produces most components with 3D printers. The company is able to print a vehicle in about 10 hours and assemble it in another hour. They are also looking at “micro-factories” that could opensource the building of future designs. In fact, the use of 3D printing allows designs based on what individual customers want, and lacks the large infrastructure costs of traditional automakers. 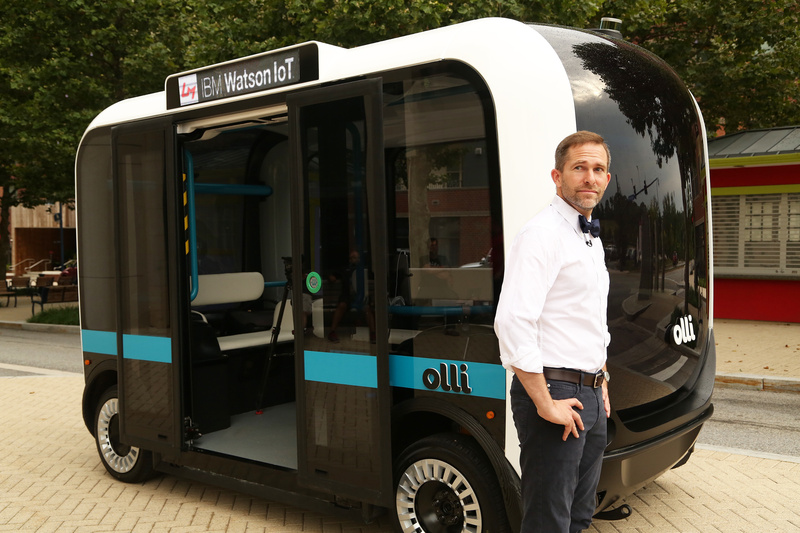 Olli is the first vehicle to utilize the cloud-based cognitive computing capability of IBM Watson IoT to analyze and learn from high volumes of transportation data, which is produced by more than 30 sensors embedded throughout the vehicle. In fact, IBM Watson will not only allow automated driving, but also interaction with passengers. Passengers will be able to interact conversationally with Olli while traveling from point A to point B, discussing topics about how the vehicle works, where they are going, and why Olli is making specific driving decisions. “By having authentic conversations with riders about their journey the more they will be connected to technology itself, making them part of the experience rather than an observer. This user experience is the key to making self-driving vehicles a real part of our lives rather than a tech vision of the future”, says Harriet Green, General Manager of IBM Watson Internet of Things in a press release.